It's time for another Etsy sticker haul! 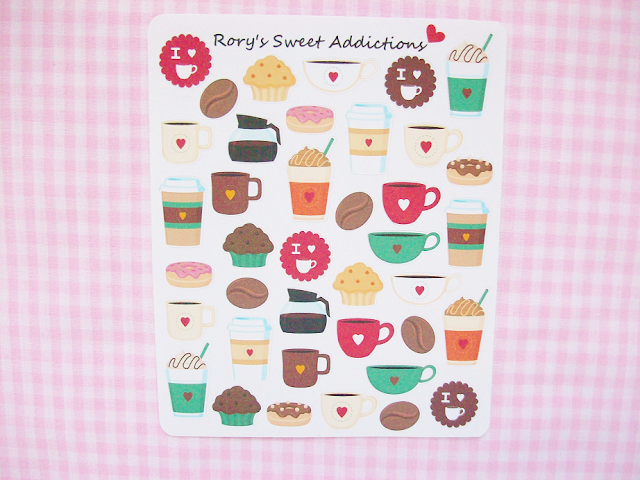 Today's featured shop is Rory's Sweet Addiction. I stumbled across Rory's Sweet Addiction while I was shopping from other planner stickers stores and fell in love with their pastel colored stickers. It took 3 weeks for my package to arrive to me. I placed my order on August 3, they shipped my package out on August 17 and I received it on August 22 (they ship out of Texas in case you were wondering). Whenever I messaged Aurora about my order she was super sweet and she even included a really cute monthly extra that you will see in just a bit! Overall, I was pretty satisfied with my order from Rory's Sweet Addiction and I would recommend this shop! But, like most planner sticker shops it will take a while for your package to arrive to you. A fun sticker sampler with a variety of stickers to choose from. She includes one of these with every order and a thank you card. When I heard that she was giving these coffee sticker sheets with every order in August I was super excited! I am a huge coffee drinker and coffee stickers are always my favorite to purchase! Make sure to follow Aurora on Instagram to see when she is giving out extra freebies and for other promotions. Now on to the stickers that I ordered! 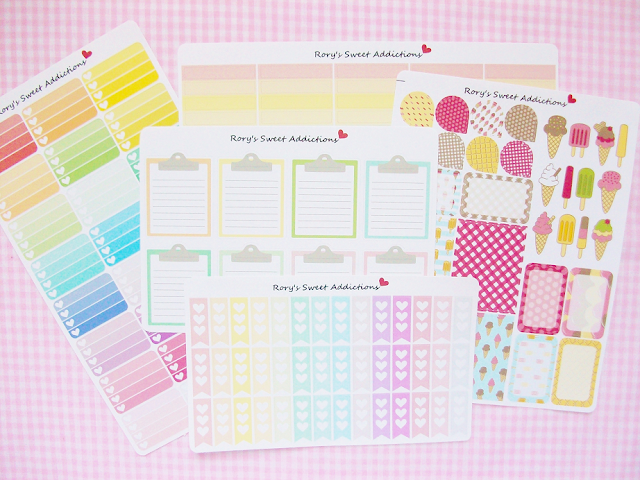 I wanted some pastel clipboard stickers for days when I have something exciting planned. 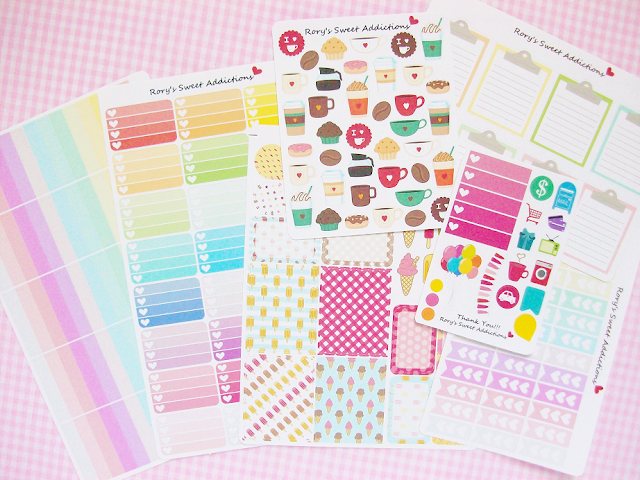 I also bought more heart checklist stickers, these are pastel and really adorable! My favorite heart checklist I've bought so far! More pastel colored stickers! I order these cute pastel section headers. you can choose whatever you want the headers to say but I decided to leave them blank so that I can personally fill out each sticker myself. I also bought rounded heart half boxes. I kind of regret getting these because I already have the half heart checklists so I didn't really need these but I will find a use for them. The last sheet of stickers I bought is this ice cream sticker set. I really wanted to make a ice cream spread in my planner but I didn't think these stickers would arrive late so that pushed back my plans (pun not intended). 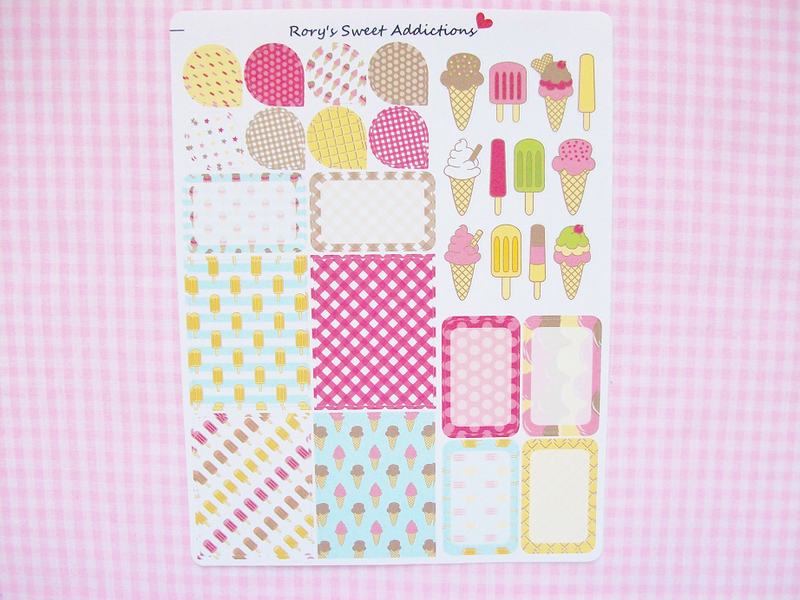 I think I might just make a ice cream/desserts week in September so that I can use some of these stickers up and not let them sit in dust. What's your favorite Etsy shop?